Could Wigan Athletic do the unthinkable twice to Manchester City? 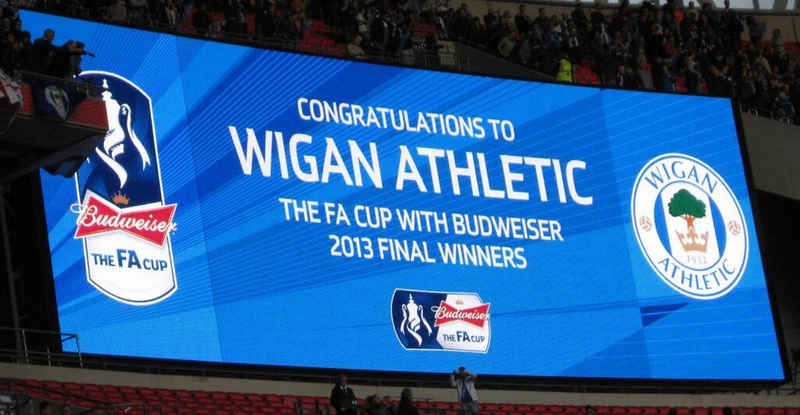 Can Wigan do it again to City? Manchester City have already secured the Capital One Cup and are now aiming for a clean sweep of the domestic trophies. They come up against their FA Cup final nemesis Wigan Athletic on Sunday with few people expecting another upset like the one at Wembley in May last year. City have the wealthiest owners in world football and have the strongest squad in the Premier League but Wigan will be hoping that all the pressure of expectation will be on City. The Latics will go into game knowing that another victory over Sheikh Mansour’s multi millionaires would send shock waves throughout football. Wigan had initially struggled in the Championship this season following relegation and a Europa Cup sojourn, but the club has been re-invigorated by new manager Uwe Rösler. The transformation since Rösler took over has been remarkable. The former City striker and Brentford manager has pushed the Latics from mid-table into the play-off zone whilst also knocking Premier League strugglers Crystal Palace and Cardiff City out of the FA Cup. The new manager has changed the style of play and made astute use of the transfer loan market, bringing in strikers Nicky Maynard from Cardiff City and Martyn Waghorn from Leicester City and midfielders Josh McEachran from Chelsea and Ryan Tunnicliffe from Fulham. Waghorn will be cup-tied on Sunday but the manager should be able to call upon top scorer and Manchester United loanee Nick Powell and FA Cup final man of the match Callum McManaman. The former East German international player has introduced a high tempo pressing game at Wigan similar to the successful German teams like Borussia Dortmund. His football philosophy is comparable to his famous countrymen Jürgen Klinsmann and Joachim Löw, with the emphasis on quick transition, and based on quick counter attack. Rösler’s impact on team matters has been exceptional: tactics, organisation, fitness, signings and team selections have all improved. The desire, team spirit and determination to win are clear for all to see. His 19 games in charge have yielded 12 wins, four draws and only three defeats. Rösler will be aware of the size of the task in hand and the wealth of talent at Manuel Pellegrini’s disposal, as an ex-City player he has a long affinity with the club and his 13-year-old son Colin is a City academy player. Wigan are now in their best form of the season having won the last five games and notably four have been away from the DW Stadium. Rösler will be relishing the prospect of competing against one of the most expensively assembled teams in world football. There is no doubt he is a determined competitor who will be doing everything in his power to mastermind the biggest double giant-killing in English football history. This entry was posted in FA Cup, Manchester City, Manuel Pellegrini, Uwe Rösler, Wigan Athletic and tagged FA Cup, Manchester City, Manuel Pellegrini, Uwe Rösler, Wigan Athletic. Bookmark the permalink.